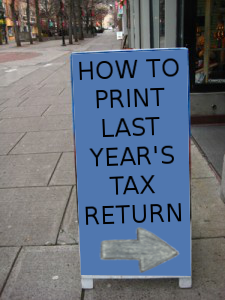 If you are in need of a copy of a previously filed and processed tax return with all the attachments, you are in luck. Whereas decades ago, if you didn't have a copy already you hoped you never needed the information, now you can request copies direct from various places, depending on how you filed. Here are a few ways you can go about that. Log into the website of your e-file provider and click on the option to "print past tax return". Contact your tax preparation agency and request a copy of your last year's tax return if they have a copy of it. Complete Form 4506 and forward/send it to the IRS. You will need your name, Social Security number and address, as well as the tax year of the return you are requesting. You will also need to include the fee of $57 per tax return in either check or money order form made out to the "United State Treasury". Copies are usually available for the current and past six years. If you don't received your copy within 60 days, contact the IRS at 1-800-829-1040 and ask about the status of your request. For more help, visit the IRS website . If you do not need an exact copy, another option to consider is requesting a transcript of your tax return instead. There are two different types of transcripts you can request: a "tax return transcript" and a "tax account transcript". A "tax return transcript" will show most line items from the original filed return, while a "tax account transcript" will have the changes that you or the IRS made after the original filing. Both are usually available for the current and past three tax years, free of charge. To obtain a free transcript, click Order a Transcript under the Online Services option on the IRS.gov website. You can also call 1-800-908-9946 to request one, or complete and mail a physical request to the address listed in the instructions. There is a Short Form Request for Individual Tax Return Transcript, as well as the original Request Form 4506-T for a Tax Return Transcript. As always, you should check that your printer is in good working order, and that you have enough ink, toner and paper to print everything you need. The clearer your documents are, the easier it is for the government to process your requests and send you what you need quicker.